​​The most important creative tool an artist can own is a working sketchbook. 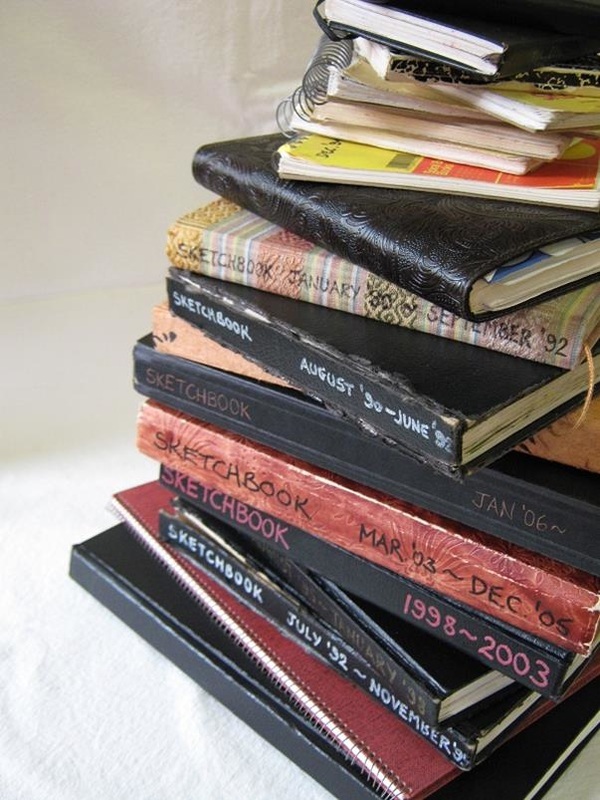 If you've never kept a sketchbook before or have started one and abandoned it then join this workshop and be inspired and encouraged. A sketchbook develops your imagination and brings the creative into your every day. It gives you a place to keep all your ideas that might otherwise be forgotten and allows you to accumulate them to build a store of personal themes to reveal your original style. collect and compile your research to build a history/record of your creative self that keeps giving and inspiring you in the years to come. painters, sculptors, fibre artists, designers, ceramicists, photographers, calligraphers, mixed media artists, writers, poets, dancers, chefs, musicians, travellers, gardeners, sports enthusiasts, pilgrims etc. NB - this is NOT scrapbooking! ​Available from one day to five days. Want to look inside the sketchbooks in the stack pictured here? Visit my SKETCHBOOK PAGE.